Directions.Q(1-5). Study the following information carefully and answer the given questions. 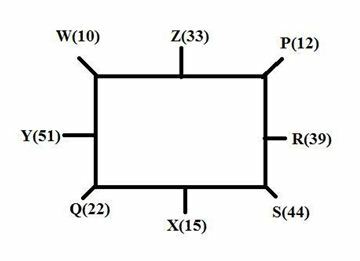 8 persons namely P, Q, R, S, W, X, Y and Z are sitting in a square table facing towards the center. Four of the persons are sitting in 4 corners while 4 of the persons are sitting in the middle of the sides. They have different number of chocolates. Those who sit in the corners have the chocolates in multiple of 2 and those who sit at the middle of the sides have the chocolates in multiple of 3. Number of chocolates hold by R is greater than 20. Chocolates hold by R is 24 more than the Chocolates hold by X. Chocolates hold by X is 3 more than the Chocolates hold by P. P sits second to the right of the one who has 44 chocolates. P is an immediate neighbour of the person who has 39 chocolates. Two persons sit between Q and the one who has 39 chocolates. Q does not have 44 chocolates. W sits second to the left of Q. S is an immediate right of the person who has 15 chocolates. Three persons sit between Z and the one who has 15 chocolates. The difference between the number of chocolates hold by Z and the one who is second to the left of Z is 6. Number of chocolates hold by S is greater than the number of chocolates hold by Z. Immediate neighbours of S are having less number of chocolates than S. Person who has 22 chocolates sits second to the right of the person who has 10 chocolates. P does not have 10 chocolates. Y sits immediate left of the person who has 22 chocolates. Y has 51 chocolates. Only three people sit between Z and Q. The sum of the number of chocolates hold by R and S is 83. Answer – The sum of the number of chocolates hold by R and S is 83. What is the difference between the sum of the number of chocolates hold by X and Z together and the sum of the number of chocolates hold by P and Q together ? What is the sum of the number of chocolates hold by W, S and X together? Two persons live between the one who goes to USA and China. The one who goes to UK lives immediately below the one who goes to France. S does not go to USA. The number of floors above R is same as the number of floors between R and M. The number of floors between R and M is more than four. S lives an odd numbered floor above the floor numbered Seven. The number of floors above S is same as the number of floors between S and X. The one who goes to Sri Lanka lives immediately above S. There are four floors between the one who goes to Sri Lanka and Australia. The number of floors below V is same as the number of floors between V and W. The number of floors between V and W is less than four and more than two. There are five persons live above the person who goes to Spain and there are five persons live below the person who goes to Italy. T lives immediately above S. Q lives immediately above U. P lives immediately above O but not in the top most floor. Two persons live between the one who goes to Bangladesh and the one who goes to Russia. Two persons live between the one who goes to Germany and the one who goes to Singapore. The one who goes to Russia and Germany lives on an even numbered floor. The one who goes to Singapore does not live on the second floor from the top. U goes to Neither USA nor China. 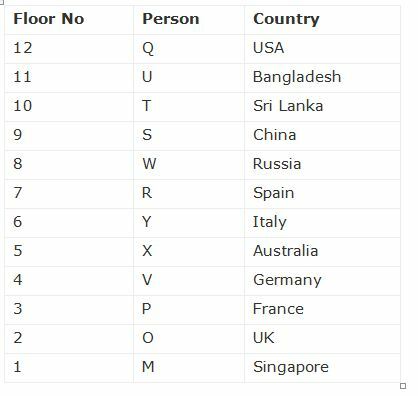 Persons who go to Either Germany or Singapore does not live on the top floor. The one who goes to China lives one of the floors below the one who goes to USA. W lives immediately above the one who goes to Spain. Only three people live between R and the one who goes to USA. Answer – 1. W lives immediately above the one who goes to Spain. Who amongst the following lives exactly between the fourth floor and the one who goes to Singapore? Which of the following pair represents the person V and the person who goes to Russia? What is the difference between the floor numbers of Q and the one who goes to Italy?